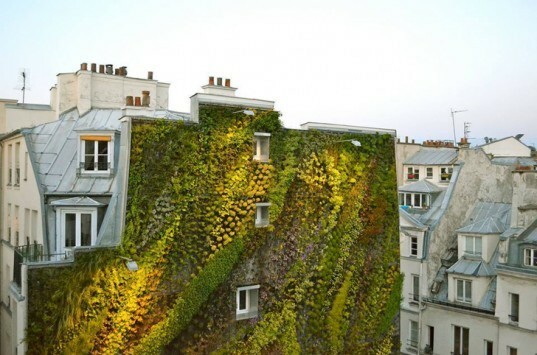 Vertical garden expert Patrick Blanc just enlivened yet another Parisian townhouse with thriving foliage. 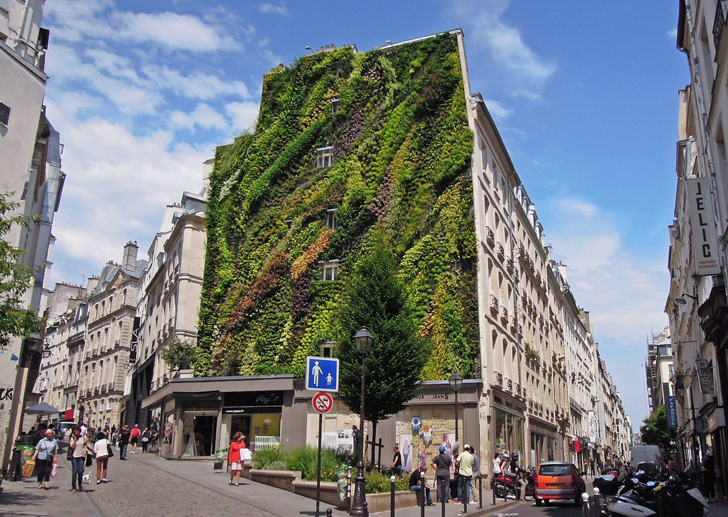 Aptly named the Oasis of Aboukir, the soaring living wall was created to kick off Paris Design Week, which runs from September 9-15. The beautiful vertical garden was installed and grown in just seven weeks, adding an infusion of greenery to the historic neighborhood. Blanc’s team began installing the framework for the gorgeous vertical garden just seven weeks ago, on the corner of Aboukir Street and the Petits Carreaux street. The designer’s original sketch shows a jungle-link pattern across the host building’s vacant façade, so the team chose varying colors of plants to make the desired texture and pattern. Deep greens, yellows and reds all converge together to make up the lush vertical garden. Starting one story above street level, the vertical garden’s pattern reaches diagonally, as if toward the sun. Over the past seven weeks, locals and passersby have been able to watch the garden bloom, slowing turning the concrete façade into a lively blend of colors. Before the garden was installed, the side of the building was an eyesore, with uneven paint and random graffiti scrawled across the surface. The vertical garden not only transformed the side of the building, but also reactivated the small pedestrian triangle below it, where the Aboukir and Petits Carreaux converge. The Oasis of Aboukir will be officially inaugurated on September 10th, during Design Week. Blanc’s team began installing the framework for the gorgeous vertical garden just seven weeks ago on the corner of Aboukir Street and the Petits Carreaux street. The designer’s original sketch shows a jungle-link pattern across the host building’s vacant façade, so the team chose varying colors of plants to make the desired texture and pattern. Deep greens, yellows and reds all converge to make up the lush vertical garden. Starting one story above street level, the vertical garden's pattern reaches diagonally - as if toward the sun. Over the past seven weeks, locals and passersby have been able to watch the garden as it slowly turns the concrete façade into a lively blend of colors. Before the garden was installed, the side of the building was an eyesore, with uneven paint and random graffiti scrawled across the surface. The vertical garden not only transformed the side of the building, but also reactivated the small pedestrian triangle below it, where the Aboukir and Petits Carreaux intersect. The Oasis of Aboukir will be officially inaugurated on September 10, 2013 during Design Week.